Note: This project is in dire need of help. If you would like to assist this project, please do not hesitate to contact somebody involved. Instructions Instructions are presented when running the program. Thanks to 12Me21, we can now properly convert characters from PTC You can download it here: http://www.galacticspaceagency.com/uploads/6/1/4/4/61446833/ptcprepsb.zip Palette emulation for text as well as custom character fonts are not yet supported. (Same goes for all color palettes and GRPs) ★☆☆☆☆ Broken: Does not start, syntax error ★★☆☆☆ Menu: Crashes somewhere between booting and starting ★★★☆☆ Starts: Game will start playing, but will eventually encounter an error ★★★★☆ Playable: Game is playable with only minor graphical or audio bugs ★★★★★ Perfect: No issues whatsoever ^^^^^^ (Caret6) ★★★☆☆ (Main game is playable but edit mode is broken, text on lower screen is only white) Dot Racer ★★★★☆ (minor color issues on title, sound issue when collecting dots) Just An Adventure ★★★★☆ (Movement issues, possibly other issues) Man: Hunter of Apples ★★★★☆ (Sprite of shiny red apple does not load) MCDS ★☆☆☆☆ (Not even close to working) Pinball ★★★★★ Race ★★★★★ RACEE ★★★☆☆ (Classic mode and Marathon mode work, all other game modes crash. Graphics are corrupt, requires manual modification of a few lines to boot) RUNRUN ★★★★★ Tales From the Labyrinth ★★★★☆ (Game runs at wrong speed (used VSYNC 2 in place of VSYNC 1 to help) missing custom sprites Tennis ★★★★★ Village ★★★☆☆ (River loads incorrectly, fish spawn off of river, can't fish. People in town will not talk to you.) No other games tested, if you test a game, let me know and if I see it and can confirm it with me, I will add it to the list. 4 Comment(s) Amoura Deep Sleep Hidden Website 2 years ago Nice concept someone is finally doing THIS yay MYCRAFTisbest Good Page Hidden Achievements Video Games I like to play video games! Hobbies Deep Sleep Hidden Website Edited 2 years ago Yeah, except I've been far to busy with other things to work on this much. I still need to at least upload the newer version, which is far more accurate. HTV04 Intermediate Programmer I can make programs, but I still have trouble here and there. Programming Strength Avatar Taboo I didn't change my avatar for 180 days Website Second Year My account is over 2 years old Website Edited 2 years ago Is there a way to make a version of ptcprepsb for SmileBASIC? 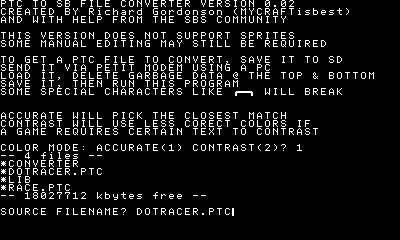 If you have a PTC file on SmileBASIC, it would be useful if you could convert it from there instead of sending it to your PC, converting it, then back. Super_Defaultio Video Games I like to play video games! Hobbies Day Person I like the warm sunshine and wake up early! Express Yourself Zelda Is Awesome! I love The Legend Of Zelda! Express Yourself 2 years ago This is good, yes, but it doesn't support G-Zero... YET... Keep working hard, man!